According to the latest FDIC Quarterly Banking Profile, U.S. credit card loan growth accelerated in 4Q17, rising 8.2% to $865 billion. Given the strong overall growth in credit card receivables, are issuers focusing their growth ambitions on particular FICO Score categories? To address this question, EMI analyzed 10K SEC filings for leading credit card issuers. 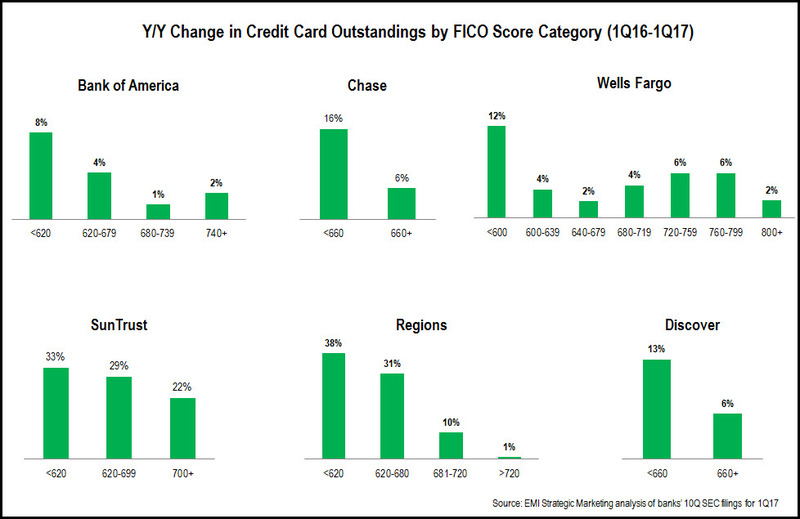 Overall, we found that issuers reported strong credit card loan growth across their FICO Score segments. We also studied trends in different issuer categories. In the aftermath of the Financial Crisis, the three leading issuers—Chase, Bank of America and Citi—focused attention away from near-prime and sub-prime segments and towards superprime consumers. This led to significant declines in both outstandings and charge-off rates. More recently, as economic growth and consumer confidence returned, these issuers have refocused on loan growth and are once again targeting lower FICO Score segments. 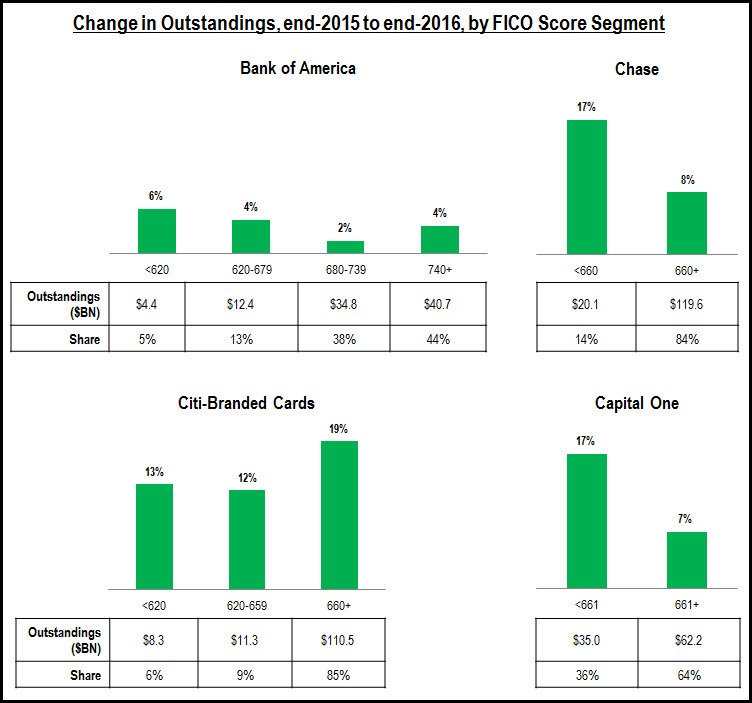 This is seen in the chart below that shows changes in outstandings by FICO Score segment between end-2016 and end-2017. As these issuers are pursuing loan growth, their credit card net charge-off rates have also increased (+26 bps y/y at Bank of America, +30 bps to at Chase, +59 bps at Citi-Branded Cards North America). However, charge-off rates remained below 3% for each of these issuers in 4Q17, and issuers should continue to focus on loan growth while charge-off rates continue at these low levels. Second-tier national credit card issuers—Discover, Capital One and Synchrony—reported relatively strong growth, but with different FICO Score segment trends. Discover reported 9% y/y growth, with no y/y change in share of outstandings for the <660 and 600+ segments. Capital One had a similar overall growth rate (8%), but this was driven in part by the acquisition of the Cabela’s card portfolio, which boosted the >660 FICO segment’s share of outstandings. 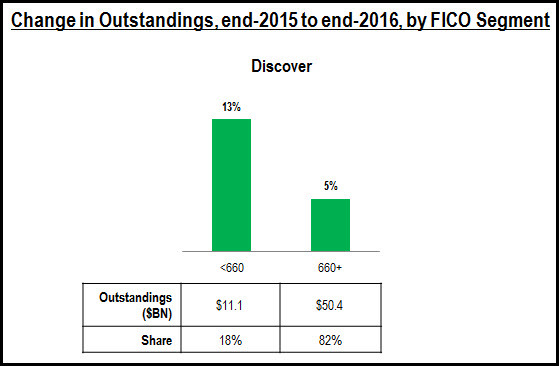 It is also worth noting that the <660 FICO segment accounted for 34% of Capital One’s credit card portfolio at the end of 2017, compared to 25% of Synchrony’s portfolio, and 18% at Discover. Regional credit card issuers present a mixed picture when it comes to the FICO Score segment composition of their credit card portfolios. This is driven by a number of factors, including a large variation in portfolio sizes, as well as their credit card underwriting standards. Most issuers report growth across their portfolios, with strong growth rates in the low FICO Score segments. Fifth Third reported very strong growth for its <660 segment, but this segment only accounts for 3% of its portfolio. Regions’ 20% growth in its <620 FICO segment was driven by its launch of a credit secured card in July 2017. Finally, as most issuers reported strong growth in their credit card portfolios in 2017, charge-off rates are also on the rise, growing 45 bps y/y to 3.61% at the end of 2017. While the overall charge-off rate has risen from a low of 2.19% in 3Q15, it is down both from post-recessionary highs of 13.13% in 1Q10, and even the 4% levels in 2007, prior to the Financial Crisis. With charge-off rates still below 4%, the leading issuers continue to be comfortable with promoting credit card loan growth. 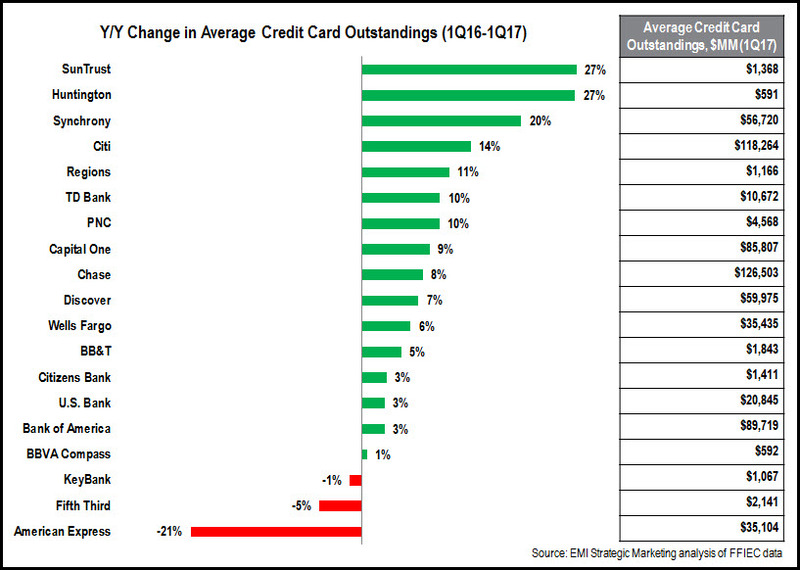 Most of the leading U.S. credit card issuers—portfolios of more than $500 million— reported y/y growth in their average credit card outstandings in the first quarter of 2017. 10 reported y/y charge-off increases of more than 20%. For 17, charge-off rises outpaced outstandings growth. These recent significant increases in charge offs follow an extended period of declining charge-off rates in the aftermath of the 2008-9 Financial Crisis. During the 2010-2015 period, issuers tightened up their credit card underwriting considerably, and consumers moved away from racking up high levels of credit card debt. According to the FDIC, the credit card net charge-off rate fell from a recessionary high of more than 13% in 1Q10 to less than 3% in 3Q15. Since then, the rate rose slightly—to 3.16% in 4Q16—but still well below levels seen prior to the Financial Crisis. And five of the issuers in the chart above (Chase, Bank of America, Discover, BB&T and SunTrust) still had net charge-off rates of less than 3% in 1Q17. Even though current charge-off rates are low by historic averages, issuers must be careful not to allow charge-off momentum to grow to a problematic level. One area of potential concern: many leading credit card issuers are reporting strongest outstandings growth for their low FICO Score segments, which tend to have significantly higher credit risk profiles. An analysis of 10-K SEC filings by EMI Strategic Marketing has found that leading credit card issuers are looking to grow outstandings across a wider range of FICO Score segments. In the aftermath of the Financial Crisis and Great Recession, issuers narrowed their focus, moving away from lower FICO Score segment, and concentrating their efforts on prime and superprime consumers. In recent years, issuers have reduced charge-off rates to very low levels. With the steady growth in the economy and rising consumer confidence, issuers see an opportunity to grow their credit card outstandings and many are willing to take on more risk in order to achieve the desired growth. The four largest credit card issuers—Chase, Bank of America, Citibank and Capital One—all reported growth in each of their FICO Score categories in 2016. Three of these issuers (the exception was Citi) had strongest growth in their lowest credit score segment. Citibank had double-digit growth in large part due to the acquisition of the Costco portfolio from American Express, and this acquisition influenced the relative growth rate of different credit score segments. 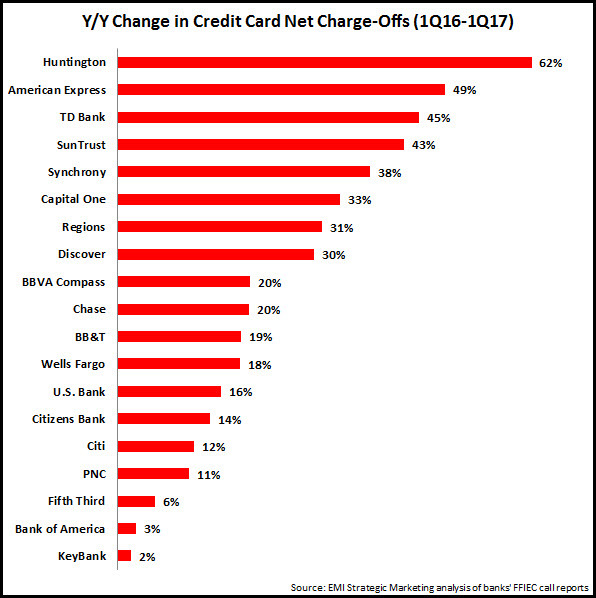 Note that 36% of Capital One’s outstandings are held by consumers with credit scores below 660, compared to only 14% of Chase’s and 15% of Citibank’s (Citi-Branded Cards unit) outstandings. Leading monoline credit card issuer Discover followed a similar pattern, with stronger growth for the <660 FICO Score segment, which accounted for 18% of total outstandings at the end of 2016. 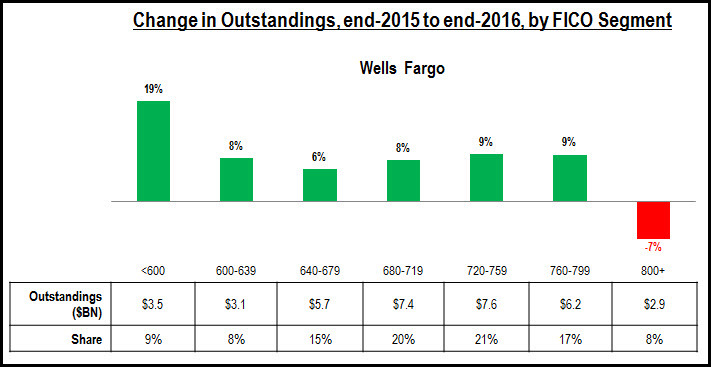 Among the regional bank card issuers, Wells Fargo reported very strong growth (+19%) in the <600 segment, and consistent growth across most other segments. However, it had a 7% decline in the 800+ segment, as it does not appear to have an affluent credit card that can compete effectively with American Express, Chase (which launched Sapphire Reserve in 2016) and Citibank. Other regional bank card issuers are also looking to drive growth across the credit spectrum. SunTrust, KeyBank and Regions have some of the strongest credit card loan growth rates in the industry, with very strong growth at the lower end of the spectrum. 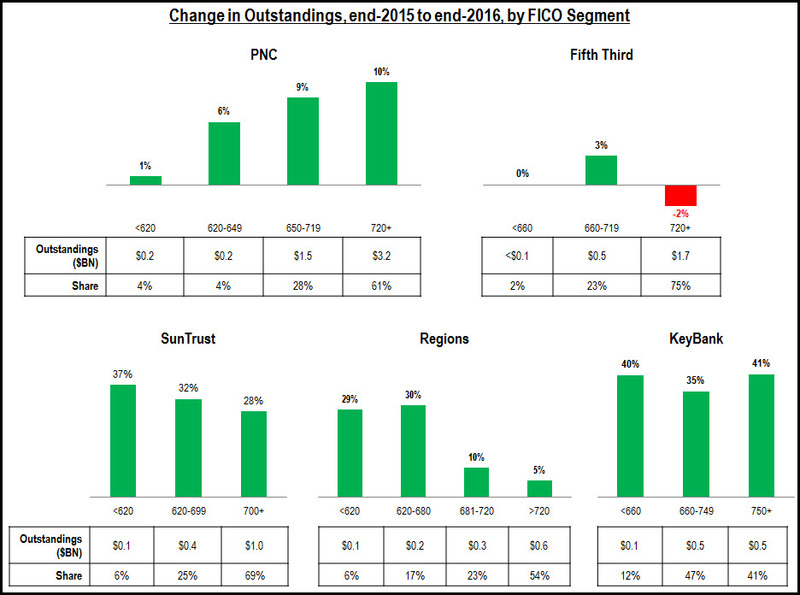 In contrast, PNC had strongest growth in the 650+ FICO Score segments. 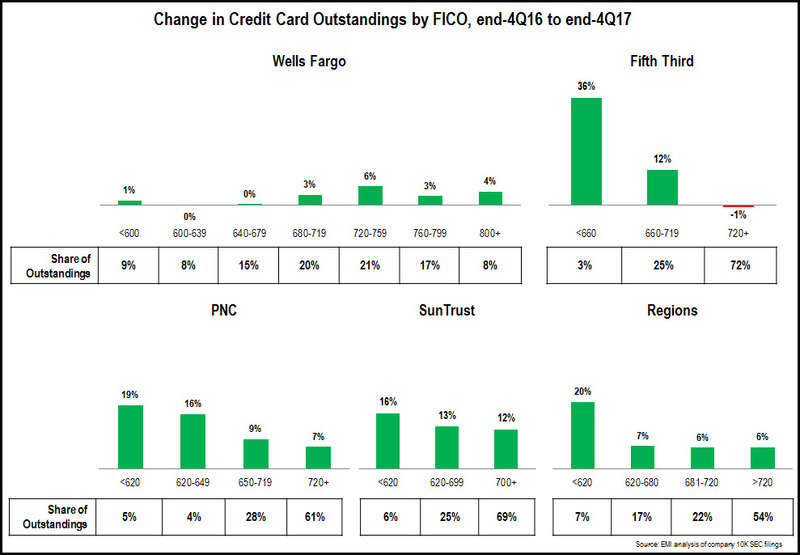 Compare the FICO composition of the issuer’s credit card portfolio to its peers. Assess the organization’s appetite to expand into new credit score segments. Have products, offers and pricing in place for a range of consumer segments. Ensure that company underwriting reflecting company objectives (while maintaining underwriting discipline).